As a graduate student, I have a limited budget and limited time to create wonderful, healthy meals. Thus, my eating routine is centered on family-sized portions of easy meals that can sit in the fridge for a week. After 4 weeks of eating chili, roasted chicken breasts, and rice and beans, I was bored. I longed for holiday break were my mom made wonderful, diverse meals every night. I needed to get out of my food funk, and fast! While strolling through Wegman’s at an obscenely early hour on Saturday, I came across a product that I thought existed in Whole Foods, Trader Joe’s, and Fairway markets. 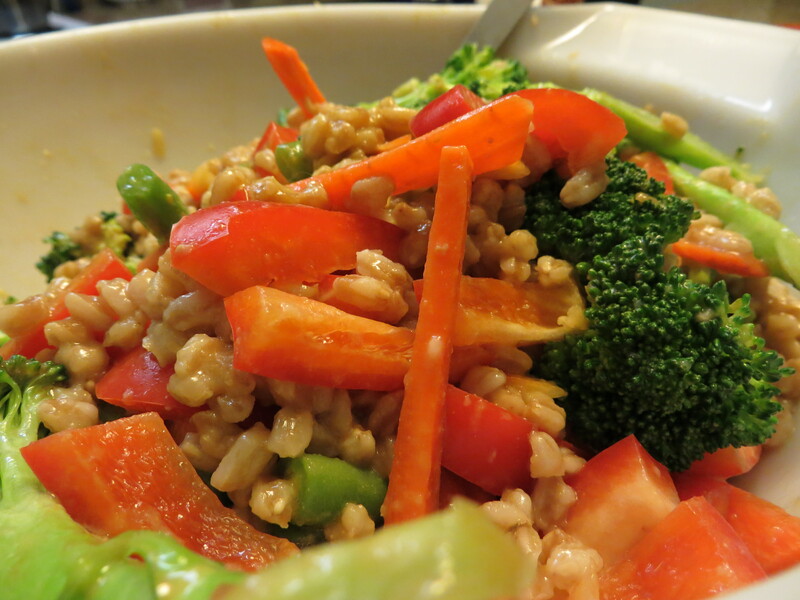 It was the mythical grain, FARRO! I love farro because when combined with beans/lentils, it becomes a complete protein (hooray for Meatless Monday options!). It also has a very pleasing texture and structure, which is perfect for use as a cold salad base. Since cold salads can hang out in the fridge and require minimal reheating, they are a perfect dinner option for this busy grad student. My find allowed me to dump the chili fixings for the produce and Asian aisles of the store – it was time to get out of my dinnertime rut. My mother has two signature farro salad recipes – one is a riff on a basic pasta salad and the other is a take on the classic wheatberry salad with dried cranberries. 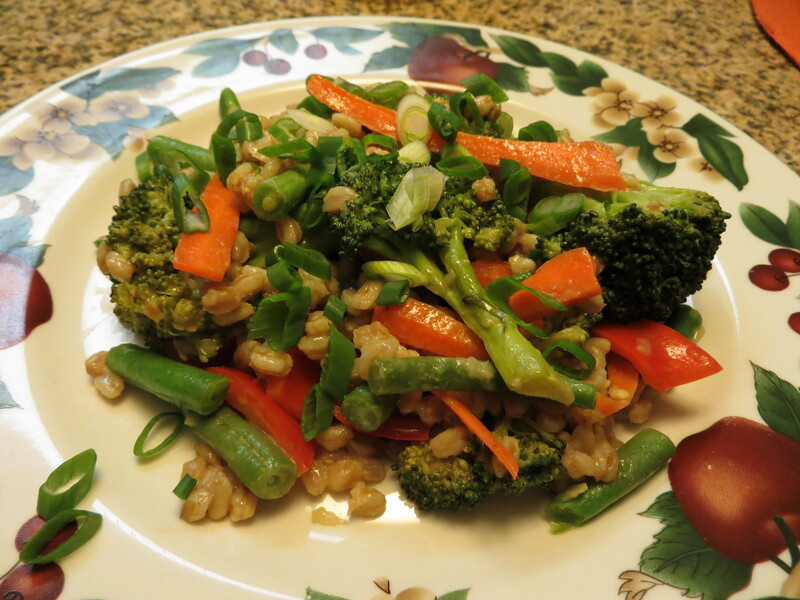 I love the “pasta salad” farro recipe (with its shredded bell pepper and green beans), but I decided to take my dish to the Far East and put an Asian spin on my dinner. My Asian Farro Salad starts with a package of farro cooked according to the box (or the bag, whichever kind you have at your local store) directions. While that was cooking, I cut up and steamed a ½ pound of broccoli (cut into small pieces) and a ¼ pound of green beans (I cut them in half). When they were cooked slightly and bright green, I dumped them into the biggest bowl I possessed. I julienned two bell peppers (minus a bit… cooking makes me hungry) and two carrots, tossing them into the bowl alongside the broccoli and the green beans. When the farro was done, I dumped that into the bowl too. The dressing is super simple and can be altered to your tastes. I do a ¼ of a cup of olive oil, a ⅛ of a cup of low-sodium soy sauce, 2 tablespoons of Dijon mustard, 1 clove of finely minced garlic, and 1 teaspoon of grated fresh ginger. Whisk vigorously and pour over the salad and toss thoroughly. I garnished my salad with some chopped scallions – chopped, roasted peanuts would also work well too! Here is a picture (or several) of the final result! Katherine……You make veggies seem like a sinful options. 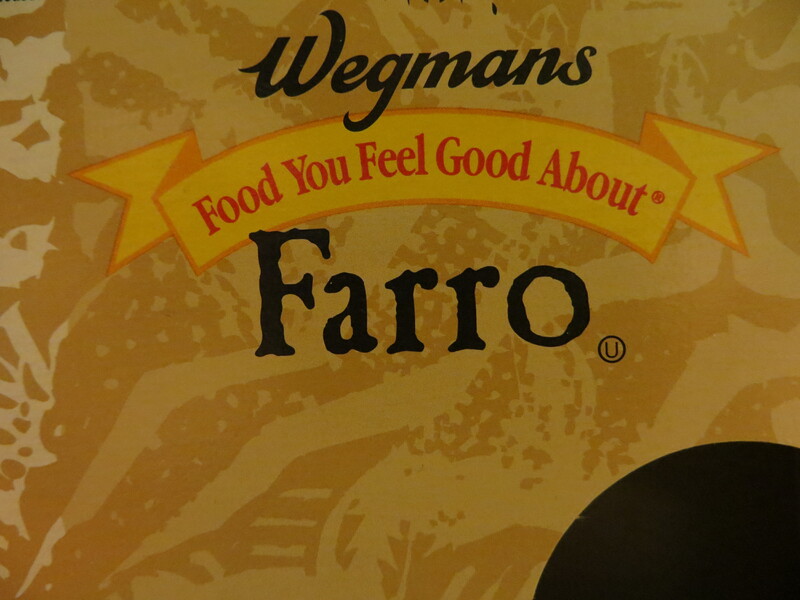 I gotta ask your mom to make faro for me…or Philip. Quite different form scouring for things in Florence, right?